The Jamnagar and Kutch areas of Gujarat are associated with Bandhani. The fabric is specially tie-dyed by hand. The art of making these cotton and silk clothes of vibrant designs and colours have been passed down through generations. The Sindhis, Muslims and Khatris of Kutch are known to have practised this art. 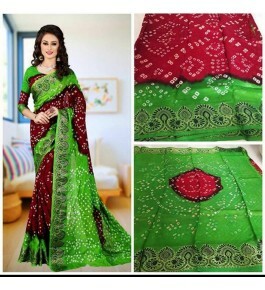 "Bandhani is a list of products and does not refer only to Sarees. It can be a turban, Saree, or even dupattas and the material may be cotton or silk. Bandhani refers to particular areas in Jamnagar and Kutch districts where this ancient art was prevailing.